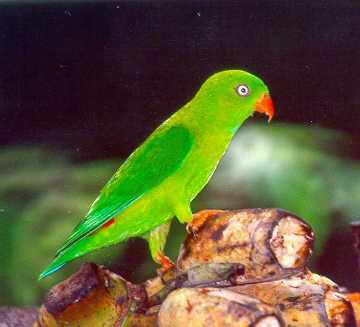 A dainty little bright grass-green parrot with short square tail and rich crimson rump. A small blue throat-patch in male; lacking in female. Singly, or small parties, in orchards and well-wooded country. Voice: A pleasant, sharp, trisyllabic chee-chee-chee repeated every couple of second. Nesting: Season- January to April.